One important aspect to consider is how to support multiple screen in Android. As we know, Android is an operating system installed on many devices. One of the most important consequence is that the developer has to face with different screen resolution and densities. There are, on the market, many devices with different capabilities in terms of resolution and density and as developer we have to take it into account in order to create an application that can have a good usability in all these devices. You can think that an android application can be executed on a smart phone and on a tablet and it should be clear the screen size differences. Reading several manuals and docs it wasn’t so clear how things work in android so i decided to write this simple guide to make a starting point for other developers that want to start coding in android. – Resolution: is the number of pixels on the device screen. It can be for example 480×800 etc. Using these concepts we can create apps that support multiple screens. There are two different aspects that we have to consider when we want to support multiple screen in Android: one is how we place object into the screen and we define it as layout and the second is the images. The first aspect has to do with resolution because we can have more or less space to place our components the second has to do with image resolution. Android has a smart way to handle different layout for different screen size and different image resolutions for different screen density. By now don’t consider please the land extension, we will see it later. As you can see all names are mapped in this structure except normal. Normal is the default layout so it isn’t mapped with its name but just with layout. Now let’s see what is inside each directory. As you can see each directory contains the same elements with all the same names. The only thing that changes is the content of each elements. Doing so you take into the account only the portrait screen orientation. What happen if the user rotate the screen or the device as a landscape screen? 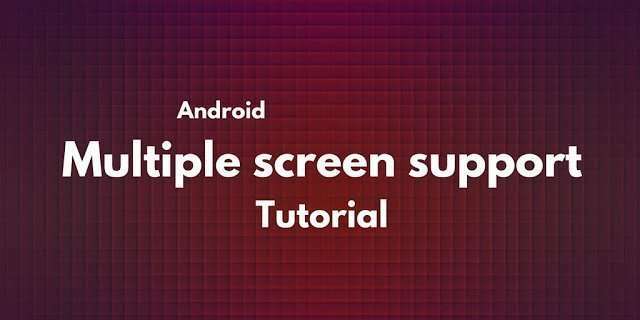 In these way we can support multiple screen in Android!!. I guess you are wondering what inside each file in land layout. Well in the landscape layout we have to place components in a different way. Let’s see how i solved this problem in a real application published on the market. This time we see a directory drawable that doesn’t have any name specification. It is the default directory that is used when we don’t want to map every density. In some other post, i will show you how to use Inkscape to create images with the right dpi. There are some best practice that we have to consider when supporting multiple screen. First of all we can’t use fixed dimension in our components. For example we can’t specify a component with using 60px. Instead using px we can use dp. Dp is a density independent pixel that is used in Android to specify dimensions in a “virual” manner. It is the SO that will adapt our virtual dimension to the real one using the real screen density. This will detected automatically by the android. You just have to go with the above said steps. Nice article, and well explained. Just one thing that I’d suggest to change to avoid confusion of terminology: what you call “density” is technically a “resolution”. What you call “resolution” would usually be a “size”. Nice article, and well explained. Just one thing that I'd suggest to change to avoid confusion of terminology: what you call "density" is technically a "resolution". What you call "resolution" would usually be a "size". PS: Dang! Just realised that Android indeed understands the terms like you do. So, ignore my post, which I cannot remove. Nevertheless the redefinition of “resolution” as an absolute (“number of pixels” or, implicitly, “pixels per screen”) instead of a relative (“dpi”) value seems unfortunate. It’s a bit like redefining “vehicle speed” as “kilometres per tank”. PS: Dang! Just realised that Android indeed understands the terms like you do. So, ignore my post, which I cannot remove. Nevertheless the redefinition of "resolution" as an absolute ("number of pixels" or, implicitly, "pixels per screen") instead of a relative ("dpi") value seems unfortunate. It's a bit like redefining "vehicle speed" as "kilometres per tank". i want to ask a simple question what should be in default "Layout" folder i mean which size of layout should be place in it "Small" or "Normal"
1. There are four generalized sizes: small, normal, large, xlarge. To declare different layouts and bitmaps we like to use for different screens, we must place these alternative resources in separate directories, similar to how we do for different language strings. Also, be aware that the screens orientation (landscape or portrait) is considered a variation of screen. for support multi screen size but i used layuot folder , exist very tablet by 7inch and about under 600dpi, how can support this tablet phone?